This fact has intimidated some (to the extent that they're scared to come join us, despite our insistent invites). Please accept this photograph as a peace offering. 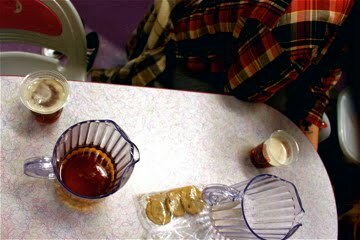 What you see pictured above is the perfect representation of what you can expect on Tuesday nights if you come join us: pitchers of beer, chocolate chip cookies*, and flannel. *okay, so Matt Higgins only supplied cookies once, thus they cannot be guaranteed, but we do mange to provide beer on every occasion. For further clarification, flannel clothing is optional. whoa - did I just see an invitation to come bowl with you guys on Tuesdays?? Dreams DO come true! I've been trying to get the Dove crew to put together a team for forever, but there are (sadly) very few sporty spices in the mix. Time to jump ship!